The term “Eagle” refers to either of two well known gold coins produced by the United States government: the modern gold bullion investor coin, or it’s ancestor, the $10 gold Eagle coin first minted in 1795 at the Philadelphia Mint. The American Gold Eagle bullion coin, produced each year since 1986, contains one troy ounce of pure gold plus additional alloy to harden the coin and make it more resistant to scratching. The total weight of the coin is therefore more than one troy ounce – 1.09 ozt. Coin collectors recognize the obverse design of the modern gold eagle as that of the renowned Augustus Saint Gaudens twenty dollar gold piece of 1907. 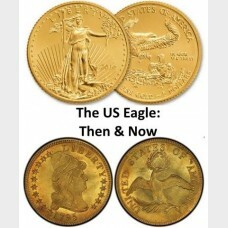 The original gold eagle was the highest value coin of the United States at the time. Struck in 22 karat gold, it featured a profile portrait of the goddess of Liberty facing right, wearing a traditional Roman Liberty Cap. Thomas Jefferson and Alexander Hamilton, the two architects of the American coinage system, hoped the new American Eagle ten dollar coin would be widely accepted in international trade. In fact, it was the smaller five dollar gold coin, known as the “half eagle,” that was preferred by world merchants, being closer in size to British gold guinea. 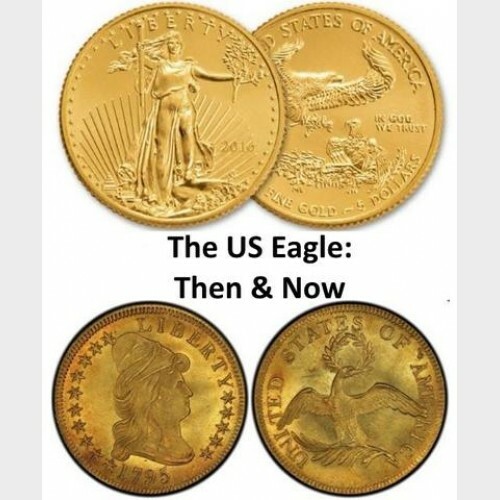 The eagle terminology also extended to the two and one half dollar gold coin of 1796 – the “quarter eagle,” and later, the twenty dollar “double eagle” of 1849. Visit us at London Coin Galleries Mission Viejo for more information.